Tanker trucks, big rigs, and tractor-trailers are very heavy vehicles that regularly travel at high rates of speed. When a large truck collides with a smaller vehicle, such as a car or motorcycle, it can cause serious property damage and catastrophic personal injuries. Serious injuries sustained in truck accidents can include spinal cord injuries, head injuries, bone fractures, soft tissue injuries, and even death. If you have suffered injuries in a serious truck accident, you need an experienced legal team on your side who can fight for you every step of the way. 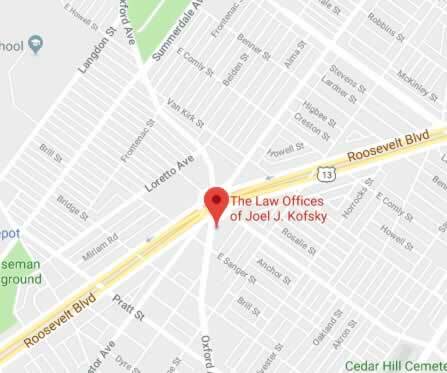 At The Law Offices of Joel J. Kofsky, our Philadelphia truck accident lawyers understand the seriousness and the disruptions these accidents can cause to your life. Attorney Joel J. Kofsky will fight for your right to recover full and fair compensation for your injuries, pain, suffering, and financial losses. In order for drivers to operate a tractor-trailer or other large truck, they must undergo special training and obtain a commercial driver’s license (CDL). Because of these heightened requirements, truck drivers are held to a higher standard of care than ordinary motor vehicle drivers. In the context of a truck accidents, commercial drivers are held to the standard of care of a “reasonably prudent truck driver” operating an 18-wheeler under the same or similar circumstances. Drunk or drugged driving – It goes without saying those who operate their vehicles while under the influence of alcohol or illegal drugs can cause serious accidents on Philadelphia roadways – usually because of impaired vision, focus, or reaction time. Distracted driving – Distracted driving can take many forms. Some common examples include texting or making phone calls while behind the wheel, or programming GPS navigation devices while driving. Fatigue – Trucking companies often encourage their drivers to drive for hours on end, often with little or no sleep. When these drivers are fatigued, their reaction time slows, and a serious accident can result. Cutting curves too sharply – When commercial drivers cut a curve too sharply, they can collide with or sideswipe other vehicles on the road, especially at traffic intersections. This can also cause a truck to rollover. Violating traffic laws – When commercial drivers fail to follow truck speed limits or otherwise violate the rules of the road, they are more likely to cause serious truck accidents. Violating motor carrier regulations – Federal and state motor carrier regulations limit load sizes and establish requirements for oversized loads and securing trailer cargo. When truck drivers violate these regulations, they significantly increase their chances of causing an accident. Joel J. Kofsky and our team of Philadelphia truck accidents attorneys can review your truck case with you and may be able to file a personal injury claim or lawsuit against the responsible operator and/or trucking company on your behalf. Trucking companies – Philadelphia trucking companies have a duty to hire and retain experienced drivers with clean driving records. Moreover, trucking companies have to conduct regular drug tests on their drivers and to properly maintain their equipment, including tractors and trailers, at all times. When trucking companies fail to take these measures and an accident occurs, serious accidents often occur. Cargo loading teams – Cargo loading teams are responsible for properly loading trailers. In that capacity, they have to ensure that trailers are not overloaded or under-loaded, in accordance with the applicable weight restrictions. Moreover, they have to ensure that all cargo is properly loaded and secured onto the trailer. When cargo loading teams do not do their jobs properly, the tractor or trailer could overturn in the roadway, or the cargo could dislodge from the trailer into the roadway, causing a serious accident. Truck part manufacturers – Truck part manufacturers have to ensure that their products are safe when they are released into the stream of commerce. These parts include tires, steering mechanisms, and braking systems. When truck parts malfunction en route and an accident occurs, manufacturers and distributors can be liable. Truck repair facilities – Truck repair facilities have a duty to make repairs in a proper and skillful manner. If a big rig breaks down on the roadway shortly after a repair was made – and an accident occurs – the repair facility may be fully or partially to blame. Governmental entities – Governmental entities can include townships, municipalities, and cities – including the City of Philadelphia. The City, for example, has a duty to maintain roadways and ensure that they are kept in a reasonably safe condition at all times. When potholes and other serious roadway defects lead to truck accidents, the accident victim may be able to file a claim against the city or other responsible governmental entity. In some cases, however, the accident victim may need to satisfy a special notice requirement prior to filing suit in the court system. 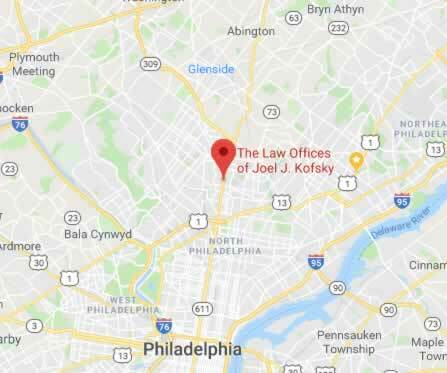 The team at Joel J. Kofsky understands that many individuals may share the responsibility for a Philadelphia truck accident. Our legal team can ensure that all potentially responsible parties are brought into your claim or lawsuit for damages. If you have suffered injuries in a truck accident that was caused by someone else’s negligence, time may be of the essence. In Pennsylvania, people who are hurt in serious truck accidents only have two years from the date of their accident to file a claim or lawsuit for personal injuries and damages. At The Law Offices of Joel J. Kofsky, our legal team can litigate your case to the fullest and help you maximize the value of your damages. To schedule a free consultation and case evaluation with a Philadelphia truck accident attorney, please call us today at 215-735-4800, or contact us online.